80% of seniors have at least one chronic health condition and 68% have 2 or more. Even though these are grim statistics, older adults can maximize health and quality of life by managing symptoms from existing health conditions and reducing the risk of developing other conditions. 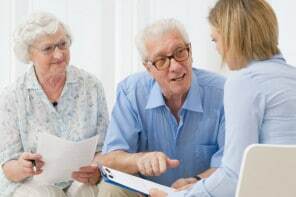 The National Council on Aging has put together a list of the top 10 chronic conditions among seniors on Medicare along with tips to prevent or manage them. To help your older adult stay as healthy as possible, we share NCOA’s helpful infographic and highlight key information about each chronic condition and its prevention and management tips. High blood pressure (also known as HBP or hypertension) is a serious condition that affects 58% of seniors on Medicare. It’s often called the “silent killer” because it has no symptoms, but damages blood vessels and increases the risk of serious (and sometimes fatal) conditions like stroke and heart attack. Nearly half of all seniors on Medicare were treated for high cholesterol. When the body has too many bad fats, arteries get clogged and cause heart disease. Osteoarthritis (OA) is the most common form of arthritis. It’s a joint disease where the joint cartilage is breaking down over time. That causes swelling and inflammation which leads to pain and stiffness. Coronary heart disease (also called ischemic heart disease) is caused when plaque builds up in the arteries leading to the heart. That decreases the amount of blood going to the heart and can cause additional complications like blood clots, angina, or heart attack. When someone has diabetes, the level of glucose in their blood (blood sugar) is too high. This can happen when the body doesn’t make enough insulin. When there isn’t enough insulin, glucose doesn’t get moved into the cells of the body. Instead, it builds up in the blood and causes high blood sugar. Over time, high blood sugar seriously damages the eyes, kidneys, nerves, heart, gums, teeth, nerves, and blood vessels. This leads to health conditions like heart disease, stroke, blindness, kidney disease, nerve problems, gum infections, and amputation. People with diabetes are also more likely to have heart disease or a stroke, and at an earlier age. Chronic kidney disease causes a slow decline in kidney function over time. That causes an increased risk of heart disease or kidney failure. Heart failure is when the heart becomes weakened and can’t pump as efficiently and can’t supply enough blood and oxygen to the entire body. This can cause changes in the heart muscle that cause fatigue, light-headedness, nausea, confusion, or decreased appetite. Depression is a treatable medical condition that is not a normal part of aging. It can cause persistent feelings of sadness, emotional numbness, anxiety, sleep problems, concentration and memory problems, changes in appetite or weight, a loss of interest in activities, and more. If you’re concerned about potential suicide, call the National Suicide Prevention Lifeline at 1-800-273-8255. Alzheimer’s disease is is a form of dementia. It’s the most common type and accounts for 60 – 80% of all dementia cases. Dementia is an umbrella term for a collection of cognitive symptoms. It’s caused when the brain is damaged by diseases like Alzheimer’s, many small strokes, or brain injuries. Alzheimer’s and other dementias cause memory loss and difficulty thinking or problem-solving that interfere with everyday life. COPD is a disease that includes emphysema and chronic bronchitis. It makes it hard to breathe and causes shortness of breath, coughing, and chest tightness.